People often ask me what my favourite dish is to cook or if I have a speciality and whilst I am not a trained chef and some of my techniques are a bit dubious risotto has to be up there and over the years I have been cooking there has been a marked improvement. Risotto truly fills me with joy and I always have to make a huge intensive effort when I am in a restaurant to not just run for the risotto and to instead try something else. And almost every time we do a food order I will add another bag of risotto rice to the trolley because we will without doubt either have run out or be on the edge of running out and not being able to do a proper risotto when I get the desire just makes me sad. Of course one of the things that leaves me torn is that as a ‘food blogger’ people can only see and hear about the food and risotto is not one of those things that ever really looks good in a photograph; maybe if I got some of those huge bowl plates and magicked up some kitchen cupboard space for storing them and had the smallest of portions then maybe it would look better but that is not me. Maybe one day I can perfect the photography and share the full delights with you by creating a recipe book or opening a restaurant that means you can enjoy the flavours as well but until then… I thought I could share some tips with you. Make sure you really give onion, garlic and mushrooms time to sweat down and be cooked in a little butter before adding large chunks of chicken. I find that adding larger chunks of chicken helps to ensure that the pieces stay succulent throughout the cooking process as sometimes smaller chunks can run the risk of becoming chewy with them becoming overcooked in a sort of boiling mixture. We tend to make our own stock with a mixture of leftover vegetable peelings and/or meat bones and then we freeze it into portions that work out just perfectly for things like risotto (they just need to be taken out to defrost at the same time as the chicken) and that really adds to the flavour with some dried herbs mixed into it rather than just an out of the packet stock cube. There was a a time when we just used to long grain rice, a recommended substitute for making a risotto a little cheaper, but it does involve treating the risotto differently with the amount of liquid put in and the way that the dish needs to be stirred. If you do want to use long grain rice it is wise to look up a recipe that specifically uses this to ensure it does not just turn either into a crunchy or a very mushy mess. I have found that using proper risotto rice makes the dish a little creamier, even with no additional dairy to that normally used, and that the structure of the dish is a lot more satisfying to look at but most importantly EAT. 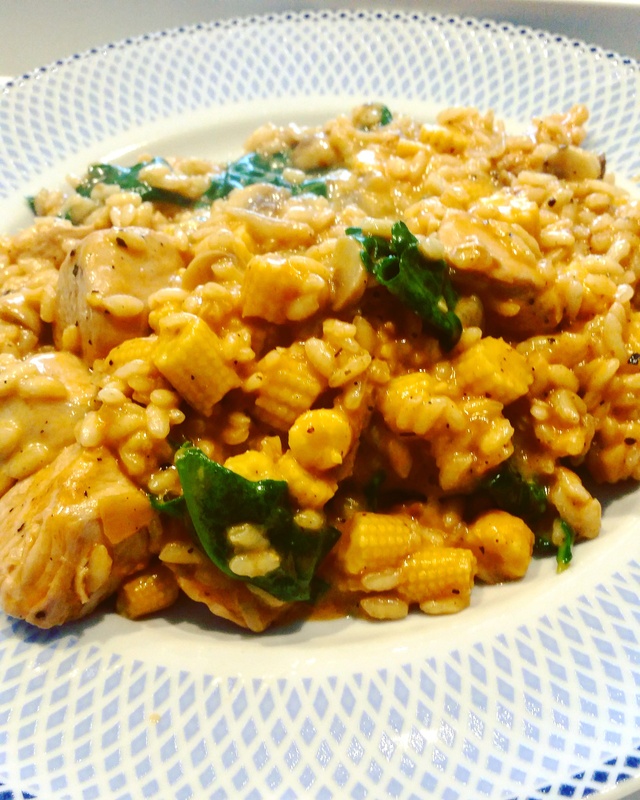 Another thing that I find makes a chicken and sweetcorn risotto a lot better is swapping out the frozen sweetcorn or tinned sweetcorn for fresh baby corns cut into decent chunks as this helps to add an additional layer of noticeable texture and fresh taste whereas individual pieces of corn can easily become overcooked and lost amongst the rice consistency. This is of course a complete luxury and not at all needed as ultimately sweetcorn kernels still add sweetness to the dish and it is still damn right delicious. Other extras and ‘extravagant’ ingredients that I added to the one pictured and will often add to a risotto includes grated mature cheddar (only a small amount as otherwise it makes that lovely cooked risotto into a gloopy mess again), half a glass of wine during the stock stage (this really helps to elevate the flavour a little and is a good way to use up the alarmingly common unfinished bottles of wine we have) and also a bit of tomato puree (this really lifts the colour and also gives it that little bit extra intensity. The pictured risotto also happens to have some spinach mixed in, once taken off the heat to keep it crunchy and not slimy, as this adds a little bit of extra colour to it and if possible I would recommend something like this and a side salad to really help give it a balance between carbs and some of your five a day (a risotto can very easily be lacking on the vegetable front and given it is often had as a meal at the end of the day you really need to make sure it has some goodness and nutrients in there). My risotto still needs a little work though in terms of the amount of liquid added at each stage and making sure that it gets added at just the right moment to ensure it does not start to stick to the saucepan as well as mastering a consistent amount of time that the dish takes (the pictured one took an incredibly speedy 35 minutes from starting prepping to serving up) so if you have any risotto tips I would love to read them in the comments below, on Twitter or over on Instagram. This entry was posted in Food and Drink, Recipes and tagged baby corn, balanced meal, Cheese, chicken and sweetcorn risotto, chicken risotto, comfort, comfort food, dairy, dinner, eat, eating, food, Food and Drink, food blog, food blogger, food bloggers, home, home cook, home cooking, lblog, lblogger, lbloggers, life, Lifestyle, lifestyle blog, lifestyle blogger, lifestyle bloggers, Recipe, risotto, risotto recipe, spinach, tasty, tasty food, tea, tomato, vegetables. Bookmark the permalink.